Hot water is something that we all take for granted — that is, until we don't have it anymore. That's why it's important to regularly maintain and, if necessary, repair your hot water tank — and that's a task that AirPlus Heating & Cooling can assist you with. And if your tank is beyond repair, we can assist with your new water heater installation. AirPlus technicians are trained in residential and commercial water heater installation, maintenance, inspection and repairs. 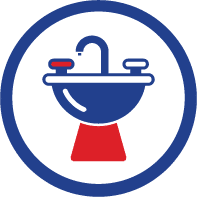 No hot water, a lack of adequate hot water, rust-colored water, foul-smelling water, strange sounds coming from the tank and popping or excessive shaking or vibrating are all common problems associated with hot water heaters in commercial and residential settings. And, while some of these issues can be resolved by the homeowner or facility supervisor without calling upon a professional, other problems require a more advanced level of expertise. This is where AirPlus Heating & Cooling can help to resolve your issues with a new water heater installation or repair. It's estimated that gas water heaters last for up to 10 years and electric ones up to 15‚ but don't think you don't have to maintain and troubleshoot certain things about your hot water heater to meet, or even exceed, these projected lifetimes. For instance, sediment has the tendency to build up at the bottom of the tank over time, which can decrease the efficiency — and the life — of the tank, and even go as far as clogging up water lines. That's where an annual tank flush can come in handy, as it can remove these harmful sediments and ensure that your hot water tank is working at maximum efficiency. Leaks and drips, the pressure valve and even the pilot light going out are other common troubleshooting areas that hot water heaters may present, whether they're located in a commercial or residential facility. Proper preventative maintenance on your commercial grade water heaters can keep your residents happy and your business open. We can help you keep your existing infrastructure running smoothly while planning for future issues and upgrades before they become disasters. A lack of adequate hot water. Leaking, whether it's occurring from the top or the bottom of the unit. A leaking pressure relief valve. The pilot light will not stay lit. Strange noises coming from the tank. No hot water is being produced at all. We service many makes and models of HVAC equipment including State, Bradford White, Apollo, Carrier, Bryant, Payne, Trane, American Standard, Rheem, Ruud, Lennox Goodman, Mitsubishi, Fujitsu, Daikin, Amana, Ducane, Comfort Maker, Heil, Armstrong Aerosys and First Company. For all of your hot water heating needs, whether it be of the commercial or residential nature, contact AirPlus Heating & Cooling. Traditional Water Heaters - AirPlus offers 5% discount to cash customers & financing with approved credit. No hot water, lack of adequate hot water, foul-smelling water, strange sounds or popping, shaking, vibrating tank. All are common problems associated with residential and commercial water heaters. Trust AirPlus experts certified to properly install, diagnose & fix all your traditional hot water heaters. Professionally Installed, Gas Water Heaters Starting At Only $2,220 or $44/month. Professionally Installed, Electric Water Heaters Starting At Only $2,067 or $41/month. Tankless Water Heaters - AirPlus offers 5% discount to cash customers & financing with approved credit. Many residential customers are upgrading to the latest "tankless" water heating technology. High-efficiency: A tankless water heater will save you money on your energy & water bills. Space Saving: Up to 80% smaller than traditional water heaters, tankless frees up space in your utility room. Our Navien Tankless Water Heaters offer a 15-year warranty giving them one of the longest lives of any water heater. All The Hot Water You Need, For As Long As You Need It! Tankless water heaters can provide nearly unlimited hot water & big energy savings. Reclaim space taken by old, bulky tanks. Professionally Installed Navien Tankless Water Heater Starting At $4,195 or $83/month. Unlike the conventional storage tank water heaters that will eventually run out of hot water, Navien's Condensing Tankless Water Heaters can deliver an endless supply because they only produce hot water when you need it which limits energy and water waste. With a Navien Tankless Water Heater, you will never have to worry about running out of hot water no matter how much you use at a single time. AirPlus is fully licensed & insured, possessing Class A Gas, Electrical, Mechanical & Plumbing licenses.